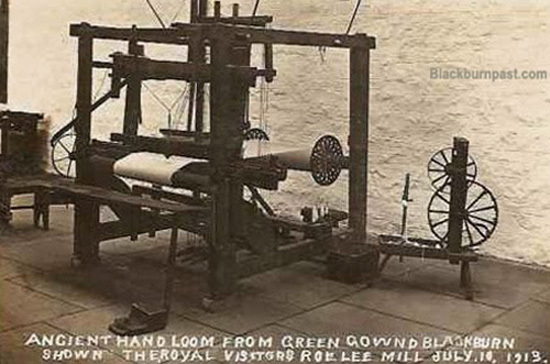 This is a postcard showing an old hand loom, like the type that would have been used from around 1780 (possibly earlier) in the weavers cottages around Blackburn. Cottages like the ones on Manor Road, Limbrick, Pleckgate, Four Lane Ends, Red Rake, Mile End, West View, Redlam, Card Fold, Livesey and various other locations around the town. Our industrial heritage began on looms like this one, before production was moved into the factory or mill system. As you can see from the caption, the loom was displayed for a royal visit to Roe Lee Mill in 1913, but the loom itself must have been used at Green Gown (on Pleckgate Road) originally. UPDATE - 06/01/2011 - Since typing the above, I have found out that a guy called Richard Ratcliffe was the very last handloom weaver in Blackburn. He had worked on power looms at Roe Lee Mill, but in 1890 he bought a cottage at Green Gown and returned to the handloom weaving he had been brought up on. He did indeed give a demonstration of his handloom weaving skills to King George V and Queen Mary in 1913 (hence the postcard). He died in 1921, aged 88. I wondered about that myself too John, as it was full of things (showing my ignorance there) that looked like this one, but I have a little booklet from the 1940's - 50's called 'Handbook Of The Lewis Textile Museum' and it lists what was in each room /area and it makes no mention of a hand loom. It mentions Cromptons 'mule', Kays 'fly shuttle loom', Arkwright's 'spinning frame' and Hargreaves 'spinning Jenny' but not a hand loom. They have a load of old looms in the far room in the other museum, which I believe came from the Lewis Textile Museum. I'll pay more attention next time I'm in there and see if there's what looks like a hand loom. You would think there would be, wouldn't you? As for the thing on the right, pass, I'm clueless. Looking at the amount of exhibits that were housed in the Museum makes you realise what a Gem of a place it was. How the hell can the Council justify closing it for a paltry amount of money it cost to keep open. The next time we have a local election and some smart arse councillor knocks at my door and tries to tell me how their party is going to improve Blackburn's future, I'm going to ask him "And what will you do to preserve it's past"
Ask the councillor if I can have a grant to keep my blog afloat too. Also ask him or her if he / she can supply the library with a load of shillings for the Cottontown meter. In fact if they throw a few more resources at Cottontown and speed it up a bit, I'll happily do without a grant for my blog. Not a problem Colin, which hand would you like me to grab him/her by the throat with !! I had a natter recently with the Girls who update the Cotton Town site, and even they are frustrated with the speed that they can access it. If all of the Coucillors gave up the cost of one meetings allowance and donated it to the cost of upgrading the Cotton Town Site it would more than cover the cost of installing extra Servers. Researching the Walsh's came from Ireland and set up as gilders and carvers in 1800's. Two daughters Eliza and Alice set up in business as dressmaker and hat maker in Limbrick 1871 Enterprising family !!! I don't sorry. I have a directory from 1894 and there's no-one of that name on Limbrick, so maybe they had moved on by then. There was a dressmaker at No 26, but her name was M.M. Southworth and she was unmarried (Miss).